In this one-hour workshop and Q+A session, Gabe uses the Space Needle’s SkyPad™ as his primary case study. Further examples include The Frick Orientation Center in Pittsburgh, and the Digital Retail Experiences at Umpqua Bank’s flagship store in San Francisco. During the development of all Belle & Wissell projects, a critical process step is a period of rigorous usability testing. The name alone reveals its purpose: how intuitive, accessible, and universal will this experience be for its users? Recently, Belle & Wissell was fortunate enough to conduct usability testing with a friend of the studio, Venerable Tulku Yeshi Rinpoche. He is a resident lama at Sakya Monastery in Seattle. Ven. Tulku Yeshi graciously assisted with a project under development, offering both words of encouragement and insightful observations. 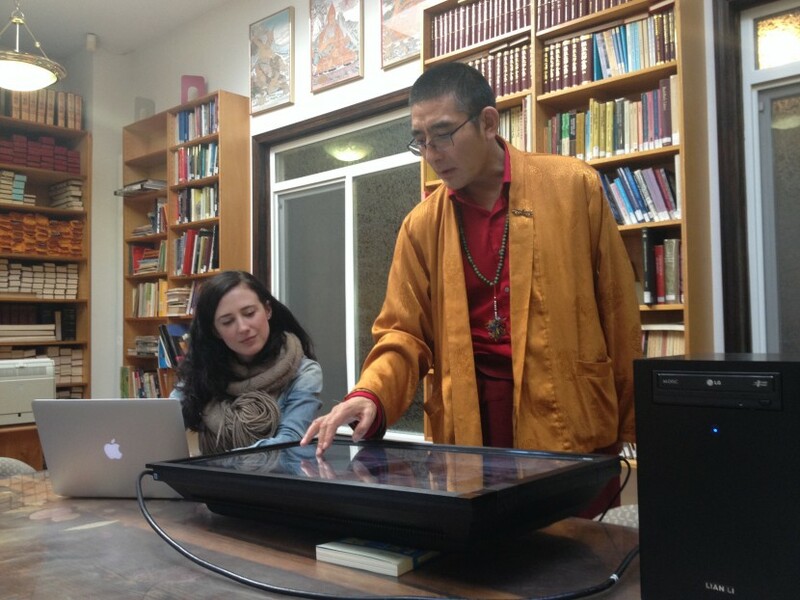 Studio Producer Sarah Faulkner guiding Venerable Tulku Yeshi through usability testing. Based on core audience profiles, Belle & Wissell selects a small group to test that best represents each audience segment. The consideration of these future users drives the final design and functionality of each new interface. Aside from being a highly important component of any project, usability testing allows the design and development teams to pre-visualize their work in action. Ven. Tulku Yeshi especially enjoyed the project’s color scheme and historical imagery. We thank Venerable Tulku Yeshi Rinpoche (and all our participants) for your indispensable assistance, comments, and enthusiasm. Learn more about the Sakya Monastery and Ven. Tulku Yeshi on his Facebook page here. Watch Gabe Kean and Thomas Ryun’s presentation at Creative Mornings in Seattle (2012) as they walk through some key projects and provide some insight on the Belle & Wissell process. Includes behind-the-scenes looks at “Nirvana: Taking Punk to the Masses” (exhibit graphic design and interactives), The Clyfford Still Museum Interactive Timeline” (interactive exhibit), “True Evel: The Amazing Story of Evel Knievel” (exhibition and arcade game design), and “Your Face is Puzzling to Me” (streetscape media installation). Belle & Wissell | CreativeMornings/Seattle. Remember back before Chuck E. Cheese? Showbiz Pizza Place was the original family fun spot, with the animatronic performing band…Rock-a-fire Explosion, powered by ’70s technology. This “show”, or set of pneumatic-driven band members (originally designed and manufactured by Creative Engineering) are being rebuilt and upgraded by Jason Rudolph in West Seattle, currently at a large, vacant retail space (formerly Petco). Jason is looking at new ways to control the band and to create new shows. First step is to rehabilitate the vintage band members. Under-the-latex, all moving parts are actuated with compressed air-powered cylinders. This is essentially a communications hub, which handles all of the switching for the pneumatic controls-currently a Tivo is sending the show controls’ timing through a bundle of wires with data that tells the band how to move and when to move, so that it syncs with the music. Watch the Rock-afire Explosion documentary film trailer. Hundreds turned out for our opening event on December 13th. We’ve included some photos that captured this memorable occasion… Story Kits available at our Etsy store.